Kovdev has been pumping out work like crazy lately, and he and Tha Plash’s latest creation is entitled Tha Plus. It looks like they were highly influnced by the newest social networking crazy, Google+. The coolest part though, is Droid Life is getting a big kick down from these boys, and they’re lowering the Market price from $2.99 for the Pro version, to just $1.99 for 48 hours. Tha Phlash is also offering up the icon pack from his site for a discounted price. 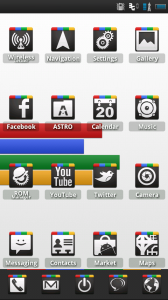 If you wanted to use the icons on more than just ADW, this is how you would do it. Including all 747 icons, it’s a true steal. What’s your favorite feature of the new Google+? We will choose three winners, and they will receive updates of the theme for 6 months from the developer. Answer in the comments section below with a valid email so we can contact you if you win. Winners will be chosen at 4pm PST today. Also, if anyone here is a Google Chrome browser user, then you’ll be excited to hear that Mr. Kover even has his own Google+ Chrome theme out now, on the Chrome Store. Definitely go check it out! Good luck everyone and thanks Dave and Tha Phlash!